Sure, he's a former number 1 overall pick, a Heisman Trophy winner and he was the NFL Offensive Rookie of the Year back in 2010. He even had a few good years in St Louis with the Rams, but he never set the league alight in a way that justified his status as a number 1 pick. 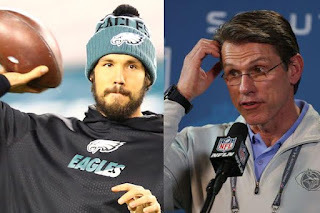 In 2015, he was traded to the Eagles, where his masterclass in mediocrity continued to such an extent that the Eagles traded up to get Carson Wentz in this year's draft, prompting Bradford to publicly express his displeasure with the move, in spite of promises that he would still be the Eagles' number 1 QB. And he probably would have been the number 1 going into the regular season, but that doesn't take away from the fact that the Eagles weren't confident enough in Bradford in the long term not to draft Wentz in the first place. And let's not forget, this is a quarterback who's never even been to the postseason. Before the season started, the Vikings were a team with heady aspirations. They're the reigning NFC North champions, they have one of the best defenses in the league and their running back is still a league leader despite being a year past the dreaded 30 mark. This is a team that some pundits even had pegged as potential Super Bowl candidates before Bridgewater blew out his ACL. Maybe some of that positivity got to the Vikings management. Maybe they started to believe it was their year to finally win the Vince Lombardi Trophy. A new stadium; a young, exciting quarterback, a powerful run game and the defense to back it up. As far as the front office was concerned, this was their year, and they weren't going to be denied by an act of god. It's good that the team's management has ambition. It's good that they want to win. But sometimes you have to recognise that it's just not your year and start rebuilding for the next, and you can't do that without high draft picks, at least not easily. If Bradford leads the Vikings to a Super Bowl title in February, I'll be the first to congratulate him and eat my words, but his track record says he's not the guy to do it, even with all the weapons around him. Sorry Rick Spielman, but you sold the farm, and you sold the team down the river for a Super Bowl run that could have waited.